How many components are there in the graph? Which component is vertex X in? Are vertices X and Y in the same component? of the merged set will be the representative of one of the two sets that were merged. The only way to refer to a set is by using its representative. This gives us a data structure with 3 real operations. One is to add a set of objects (connected vertices) to it. Another is union which specifies two objects (vertices), and merges the sets containing those objects (adding an edge). The last is find which takes an object, and returns the representative of the set to which that object belongs. is just linking that list into the set. Union is taking one set, and appending it to another. Find is searching the lists to figure out which set contains a particular element. then this is a really awful running time. 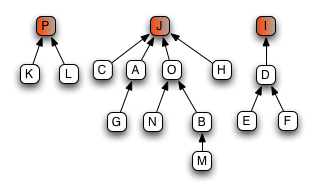 attaching one tree a a child of the other trees representative (O(1)), so it’s also O(lg n). enough to keep the amortized cost of all operations at O(lg N). So doing tho find(C) was fairly expensive – it required us to visit three nodes, and re-link two. But now, doing finds on C, A, and G will be fast next time. In fact, this approach does a better job of keeping the trees shallow and bushy than rank, with no extra storage overhead. And the cost of both union and find remains an amortized O(lg n). 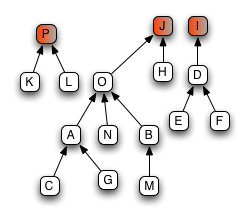 This entry was posted in Computational Complexity, Graph Theory, Set Theory on September 6, 2007 by markcc. I suppose we’re really interested in how many components there are, given that we want to ask it twice. Ooh, that’s really cool. This section of the series is really driving home for me the need for good data structures. I never gave much thought to just how much small details of a data structure could influence the difficulty of a problem. Just looked at the Wikipedia page: if you do ranks and path compression, the average time per find becomes O(alpha(n)), where alpha is the inverse of the function n -> A(n,n), A the Ackermann function. For all remotely reasonable n, alpha(n) ≤ 5. Any chance of modifying your CSS to not use absolute font sizes? This font size is too small for me, and changing my browser’s font size setting has no effect. Please advise. Thank-you. Suppose you’ve got a huge graph – millions of nodes. And you know that it’s not connected […]. And there are constantly new vertices and edges being added to the graph, but nothing is ever removed. Come on, tell us what you’re *really* doing! No, I’m *not* describing anything about Google’s database. I don’t even know if google’s crawlers use union find. There’s are several good reasons that I don’t discuss my work on the blog. One is that the blog is something I do for fun – it’s a relief from work; I don’t want to draw work into it, or it into work. Another is that anything involving my work rightfully belongs to Google. Google doesn’t mind me blogging, and they don’t mind me saying that I work for them, but because of how we work at Google, we’re held to a very high standard of confidentiality. If I were to talk about my work in any detail, I’d be likely to slip up and give something away. I like working for Google *way* to much to even take a chance of doing that. Seriously (again): I understand completely. Thanks for blogging about interesting things, whether they’re linked to your work or not! If my dim memory serves me right, union-find first became important in FORTRAN, where it’s needed for the EQUIVALENCE operation? Or am I misremembering it? heres how i would write union, is this way good or bad? – the fully dynamic case, with edge removals? There are some very complicated algorithms out there; I’d love something easy-to-implement that gave O(log n) find and delete; I’d settle for restrictions such as planarity. I ask because when searching for ways to tackle the above, I was stymied by too-deep-for-me theory and algorithms whose expositions took upwards of 50 pages… So I ended up with an O(n) solution. Unfortunately, Internet Explorer 6 has a bug that prevents it from resizing text specified in terms of pixels. If possible, the best solution is simply to upgrade, either to Firefox, Opera, or (as a last resort) Internet Explorer 7. There are a number of design problems that can’t be overcome without specifying at least one font in pixels. For example, when translating a relative size (say 116.667%) into pixels, each browser has to decide how to round the result, and they all do it in subtly different ways. In IE6 in particular, 16 * (10/16) * 80 does not equal 800. Alas, one base font size is enough to throw IE6 out of whack. I’m not claiming that any of those problems affect this layout, just trying to explain why someone might choose to define the size in pixels when on the surface it seems as if relative sizes would work just as well or better. If upgrading your browser is out of the question, you might consider forcing the main text font to Verdana, which displays slightly larger than most other fonts at a given size. Trebuchet (which is used by default on this blog) appears smaller than average in most situations, so Verdana could be a significant improvement.